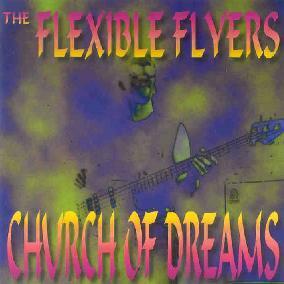 The Flexible Flyers - "Church Of Dreams"
The Brainchild of Dr. Toddzilla, aka Todd Perkins, Church of Dreams is a trip from the past straight into the present. Toddzilla and his band are a group of entertaining, multitalented players. The Flexible Flyers seem equally comfortable playing groovy sixties psychedelia like opening track Isobel is Flying, 70’s funk like bouncy Op-Art Mini-Dress, early 80’s New Wave like the delightful Chainsaw Holiday, and more modern sounding pop rock like the stylish Full of Light. Taking their versatility a step further, they spin out some reggae on Zamboni, and do a couple of slower numbers like the luminous Peace in Your Time, the chilling The Ice Maiden, and the breezy 70’s California mellow rock of Cynthia Smiles. There’s nothing overtly weird or freaky on Church of Dreams, despite the mild psychedelic aspirations, but there is a whole slew of great songwriting, and Perkins’ wonderfully twisted sense of humor throughout. For more information you can visit The Flexible Flyers web site at: http://www.churchofdreams.com. Visit the Reptile House Records web site at: http://www.reptilehouserecords.com.